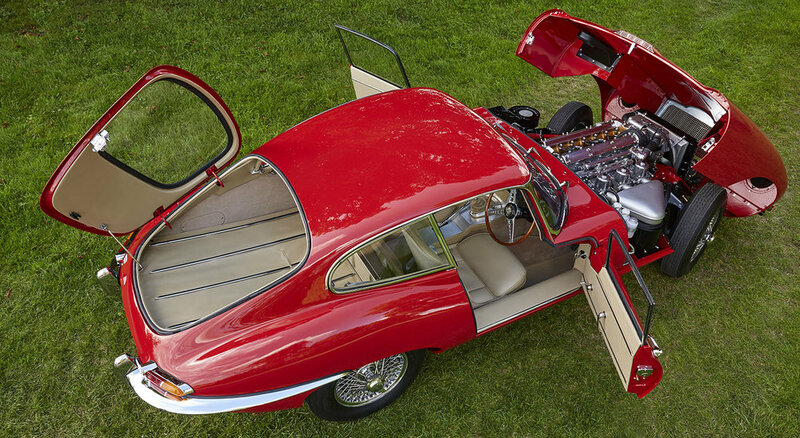 The motoring epitome of the Swinging Sixties and British Cool, the timeless Jaguar E-Type still turns as many heads today as it did when first revealed at the 1961 Geneva Salon, where its caused a sensation. Long, low and sleek, the Jaguar E-Type was famously once described by no-less than sports car guru Enzo Ferrari as "the most beautiful car ever made." The E-Type has attracted countless other plaudits too, including Sports Car Illustrated’s ‘Top Sports Car of the 1960s’ title. The Series 1 E-Type models, which are by far the most valuable and desirable, essentially fall into two categories: Those made between 1961 and 1964, such as this example, had 3.8-litre engines and non-synchromesh transmissions, with the later 4.2-litre models adding a fully synchronised gearbox and also reclining seats. The purity of the original Series 1 E-type coupes and roadsters was never matched or bettered by Jaguar’s later updates to the sporting GT. A 2+2 coupe with an extended wheelbase and less resolved proportions followed, as did the Series 2 models in 1968, and the final V12-powered Series 3 variants in 1971. The iconic Jaguar E-Type has starred in many famous movies and TV programmes, from The Italian Job, Casino Royale and Diabolik, to The Avengers and Rush. This Jaguar is presented in its original Carmen Red with tan interior, with less than 45,000 recorded miles. Any discerning classic car buyer currently looking for a perfect Series 1 E-type Coupe on the market will struggle to find better than this exceptional example, which comes with a full restoration dossier, plus a unique and fascinating history. The coolest cat of them all, the Jaguar E-Type is the realisation of many a motorists' dream, with this immaculate Series 1 3.8 Coupe being the ultimate example of the breed.